What ballast is in your boat? We continue to reflect on Jesus’ Sermon on the Mount in today’s liturgy. Two more “antitheses” are given. In the antitheses we see Jesus leading us into the core of the law and in doing so he is giving us a new law – the law of love, divine love. In the Fourth Gospel, Jesus says it like this: “No one has greater love than this, to lay down one’s life for one’s friends. You are my friends if you do what I command you.” Today, in St. Matthew’s Gospel, we hear a teaching on the same law of love. The first one deals with retributive justice – “an eye for an eye, a tooth for a tooth.” The idea conveyed in this law is that when one party is injured the offending party must make restitution for the loss. An eye should be replaced by an eye (or its equivalent value) and so forth. The second antithesis deals with loving our enemies. Rather than just loving our neighbors, Jesus teaches that we should also love our enemies and those who persecute us. Jesus teaches us this law not only in his words but in his very self, especially in his passion and death. Jesus confronts evil on our behalf. Through this confrontation he lays down his life in love. In his death, he loves “to the end” – nothing, no power of this world, can stop his act of love. In his resurrection, he is victorious over evil. Evil has run its course on him and could not prevail. Hence, the power of love and its effects are demonstrated in and by Jesus himself. He commands us to live the same law of love. Full justice can never be obtained for wrongs we endure in this world. If we seek that type of justice we are bound to frustration and anxiety. Peace will be achieved only to a point. The quest for healing leads us back to Jesus and his law of love; it is only in mercy that we can truly be free. Evil endured is conquered through love. Jesus concludes this teaching with the words: “So be perfect, just as your heavenly Father is perfect.” Jesus is calling us to reflect the love of God in our lives. The act of love will lead us on the path of perfection. The quest to love as the Father loves is ongoing. Jesus is not calling us to perfection, as the term is used in today’s culture, but to “be perfect” by loving as the Father loves; by forgiving as the Father forgives. Msgr. 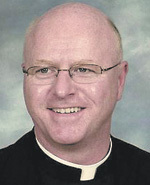 Joseph Prior is pastor of St. John the Evangelist Parish, Morrisville.